A scientific study has shown that people's taste preference for Marmite is in their genes. Called The Marmite Gene Project, the study commissioned by the Unilever brand gives weight to its long-time marketing slogan, "Love it or hate it". DNAFit, the genetic testing centre behind the research, has published a scientific white paper detailing how people are genetically more likely to be lovers or haters of Marmite. DNAFit conducted a clinical trial among 260 adults in the UK, taking cheek swabs from participants after they tasted Marmite. Scientists discovered 15 genetic markers linked to people’s preference for the product. The study is part of a campaign created by Adam & Eve/DDB. 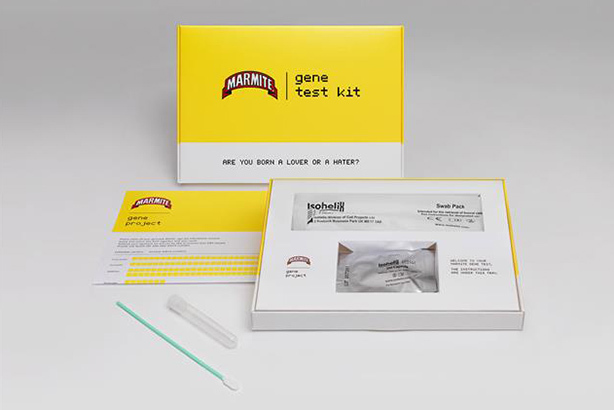 People will be able to order their own gene testing kits to find out if they are born Marmite lovers or haters. A TV ad, directed by James Rouse through Outsider, will break on 9 September during The X Factor on ITV. An app made by AnalogFolk will use facial recognition software to analyse whether users are more likely to be Marmite lovers or haters. Thomas Roos, principal investigator of The Marmite Gene Project at DNAFit, called the research results an "exciting discovery", yet he said Marmite lovers might still be able to convert friends or family who are born haters. "Like anything in genetics, taste preference is dictated by both nature and nurture," he said. "Our environment can impact our taste preference as much as the genes we are born with." Philippa Atkinson, Marmite brand manager, said: "For over a century we too have been questioning why the nation are so clearly divided between love or hate for Marmite. Finally, we have the answers. The DNA data provides a glimpse into our taste preferences."